This case study demonstrates the significant advantages of the Uniflow model 4230, specifically at Worthen Industries, a major pressure-sensitive adhesive (PSA) manufacturer. The platen on Uniflow drum unloaders has a heat transfer surface area of 6,000 square inches, which is about twice the area of the platens used in competing models. A larger heat transfer surface increases the melt rate, resulting in higher pump rates. Worthen had recently installed two new hot melt drum unloaders built by a competitor, each of which was expected to pump 600 lbs of pressure-sensitive adhesive (PSA) per hour. However, the actual achieved pump rate was only 325-350 lbs per hour, preventing Worthen from meeting its production goals. Steve Hutter, Chief Manufacturing Officer at Worthen Industries, needed to move quickly to obtain a hot melt drum unloader that could keep up with production requirements, but he didn’t want to get burned again. The sales cycle for capital equipment in this industry is typically between six months and two years, but this sale via IMMCO was completed very quickly. IMMCO received the initial call from Steve Hutter on February 20, 2018. Steve was interested in buying the next Model 4230 that came out of production, but he wanted to ensure it could actually pump no less than 500 lbs per hour. An IMMCO representative offered to schedule a test run at IMMCO’s plant using Worthen’s PSA with the stipulation that Worthen could cancel the purchase order (PO) for any reason within one week after the test. This may sound like a bold move, but our IMMCO rep was confident that Steve would buy the Uniflow once he saw its performance. A Worthen rep arrived at the IMMCO plant on March 15. The Model 4230 pumped the PSA at 600 lbs per hour, meeting the expectation set by IMMCO. This unit was a standard Uniflow model that uses a programmable logic controller (PLC). All of its electrical components were off-the-shelf and can be ordered directly from the manufacturer, usually with next day delivery. IMMCO also keeps an extensive inventory of components on hand, with most parts available for same-day or next-day shipment. The original purchase didn’t include any options, but Worthen added a semi-automatic bleed/boost valve to their system after realizing its value. This feature increases the productivity and safety of drum unloading operations, a feature that was not available on the competitor’s models. A bleed/boost valve set allows the operator to bleed air from under the platen on a new drum and apply boost air under the platen in an empty drum, all from a touchscreen. This eliminates the need for the operator to reach into a hot drum after each drum change. Worthen maintains its equipment with its own maintenance staff, as is the case with most of IMMCO’s customers. IMMCO trained Worthen’s personnel in the safe and proper use of the new Uniflow machine. Moreover, the IMMCO team reviewed the operation of an older, hydraulic-style Uniflow. They made suggestions that enabled Worthen to increase the output of their older machine. This increase in production capacity was valued as much as the prompt delivery on the new Model 4230. Everyone at Worthen loved the performance of the Uniflow Model 4230, although the results were routine for IMMCO. Furthermore, the Worthen reps liked the simplicity of the 4230’s design, its ease of operation, and the short lead time, which was six weeks from the first call to the unit’s delivery, and less than two weeks after the order was placed. In comparison, the standard lead time for the delivery of capital equipment in this industry is 12 to 14 weeks. IMMCO has continued to work on reducing their lead times for orders, and can now ship most Uniflow Model 4230 units within one to four weeks from the time of order. 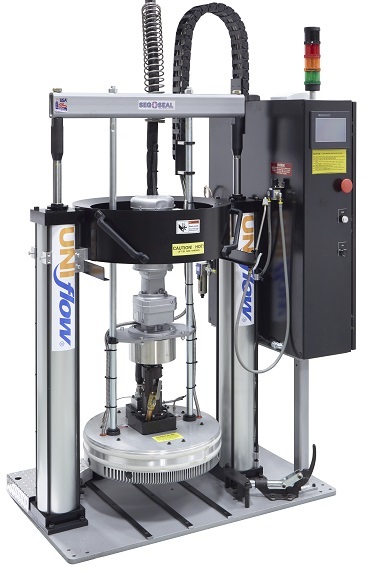 IMMCO’s customers have historically chosen Uniflow products for difficult HMA applications, but the price point has caused IMMCO to miss out on more routine applications. The Model 4230 is proving to be a game changer in this regard. The 4230 has a highly competitive price point but still outperforms every other hot melt drum unloader on the market. Customers who previously needed to choose between price and performance can now get both with a Uniflow Model 4230. IMMCO guarantees that Uniflow Model 4230 machines will outperform competitors’ machines by at least 40%. If the machine doesn’t, you can return the equipment within 30 days and get a full refund. In many cases, the Uniflow model 4230 can be shipped within two weeks from the time your order is placed. Click here to learn more about our hot melt adhesive drum unloading equipment.